Designed for children 18 months to 4 years, the Easy Steer Sportster offers a fun way to ease the transition from strollers. 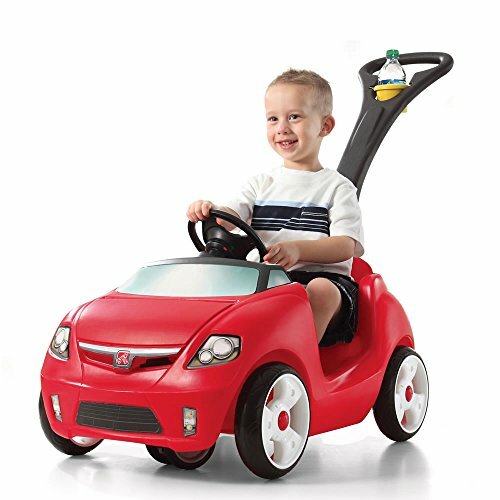 This push car's full-turn front wheels provide optimal maneuverability for comfortable handling around the neighborhood or anywhere else your little adventurer would like to go. 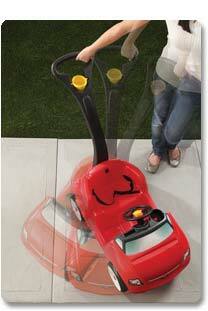 Additional features include Whisper Wheels for a smooth, quiet ride, and a folding handle for easy transport and storage. And with two cup holders, seat belts, and a steering wheel with horn sounds, this Sportster is sure to please parent and child alike. 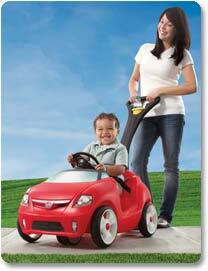 Kids can steer with the steering wheel, or adults can take over with the push handle. View larger. Full turn front wheels provide supreme maneuverability. The single-seat Easy Steer Sportster is a stylish, safe ride for your little one. Resembling a red convertible, the Sportster is formed of lightweight yet durable plastic. The car has a large storage area under the hood, a child's cup holder, and an in-dash phone holder, and it comes with seatbelts that can be adjusted around the waist of your passenger for a safe, snug fit. Caster wheel retracts for riding on rough terrain. View larger. 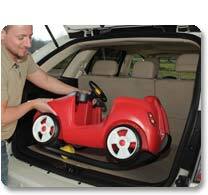 When play is done, the handle folds into the car for easy storage and transport. View larger. Boasting Whisper Wheels for a smooth, quiet ride, the Easy Steer Sportster's full-turn front wheels provide 360-degree maneuverability for comfortable handling. While adults use the push handle to control the Sportster, kids can use the steering wheel to operate separate caster wheels that control swivel turning. The casters can retract for riding on rough terrain, or for allowing adults to take control of steering. To ensure easy operation, the Sportster's lightly textured handle can accommodate two hands for a secure, steady grip. 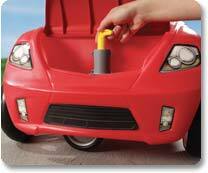 The handle includes an adult cup holder that pivots to stay level with the ground while cruising along. When not in use, the handle folds under the unit for compact storage. The Easy Steer Sportster took our testers about 30 minutes to assemble. The most difficult part of the process was attaching the front and rear wheel axels, which required significant effort to hammer into the car's underbody. The rest of the components were easy to install by comparison. Once assembled, the Sportster performed as designed. Steering was easy, thanks to the sturdy handle and full-turn front wheels. The handle was equally easy to fold away for quick storage. Young children will undoubtedly enjoy the fun, interactive nature of the ride, and adults will appreciate the convenient handling and storage features. Step2 Easy Steer Sportster, sticker sheet, and instruction sheets.